Moscow State University student Varvara Karaulova at the Lefortovsky District Court, October 2015. Moscow’s Lefortovsky court has extended the arrest of Russian student Varvara Karaulova until September 27, TASS correspondent reported on July 22. 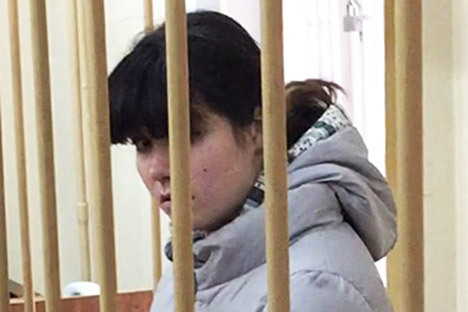 Karaulova, who changed her name to Alexandra Ivanova, is accused of attempting to join the Islamic State (ISIS) terrorist organization banned in Russia. "The court ordered to fulfill the investigation request and extend the arrest of Karaulova until September 27," a judge said. Investigators requested to extend Karaulova’s arrest saying it is necessary to wait for the results of psycho-linguistic judicial expertise. Varvara Karaulova, a 19-year-old student, sprang to notoriety in Russia and abroad at the very end of May last year when she walked out of her apartment telling her parents she was going to the university but turned up at an airport and boarded a flight for Istanbul. Operatives from the Turkish office of Interpol detained Karaulova and another twelve Russian citizens during an attempt to cross the Turkish-Syrian border. All of them had supposedly come to trickle into Syria and join the ISIS militants. Karaulova, who was escorted by her father on the return trip, came back to Moscow from Istanbul on 12 June 2015. Upon completion of a formal security check on her the court decided to refrain from instituting a criminal case against her. On October 27 the court arrested the people who had recruited Karaulova herself and had tried to enmesh her in the ISIS operations. On November 11, the court denied the girl's request to be placed under house arrest and said she had admitted her guilt. Investigators said they feared Karaulova would try to contact her recruiters if she was released from custody.